Vancouver, British Columbia--(Newsfile Corp. - September 25, 2018) - Nicola Mining Inc. (TSXV: NIM), (the "Company" or "Nicola") is pleased to announce and confirm the presence of a previously unexplored mineralized zone north of the historic Craigmont open pit. The near-surface zone is located within the boundaries of Nicola's active Mine Permit M-68. Nicola targeted the area after historic data and recent mapping from the Company's 2017 and 2018 Exploration Programs revealed the potential of mineralization north of the pit. The second exploratory diamond drill hole (CC-18-02) targeting the northern extension of the Craigmont Pit Halo (the "Mineralized Halo") (Figure 1) was located approximately 100 metres from the pit and intercepted 1.05% Copper over 73.6 meters. The results confirm the existence of an in-situ mineralized halo adjacent to the Craigmont pit that is within the Craigmont Central exploration area. The mineralization within the hole appeared unique because, in addition to chalcopyrite, the presence of bornite was seen for the first time. Bornite often occurs closer to the source of high-temperature source of copper mineralization. Frank Hogel, Chairman commented, "It is becoming increasingly clear that this is a very special project. The Company understands the importance of combining the zones to create one large consolidated deposit. We look forward to providing additional exploration and operational updates in subsequent news releases." 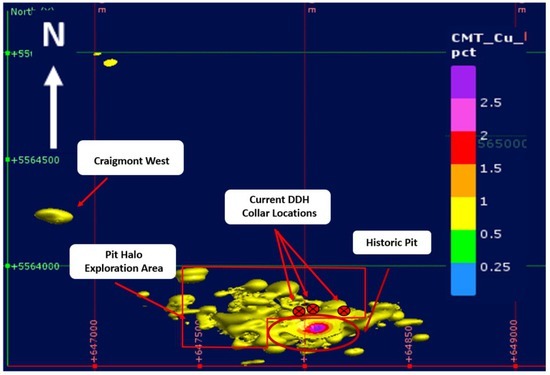 A key target planned for Nicola Mining's 2018 Exploration Program is exploration of a Mineralized Halo, which represents an outward zonation of mineralization within the altered wall rock of the skarn deposit, particularly along the contact between the Guichon and the Nicola group rocks. This mineralization occurs within an unexplored zone that is within the active mine permit. While historic Craigmont ore bodies are well-delineated and documented, previous operators conducted minimal exploration beyond proven ore bodies grading below 2.0% copper. The Company's exploration program continues to target known mineralized zones within the skarn units that were under explored by previous operators. In addition, the Company plans to drill untested porphyry targets which may represent the source of the known skarn hosted copper mineralization of the historic Craigmont mine. Peter Espig, CEO commented, "The initial drill result is very exciting, not only because of the high-grade copper mineralization, but also because of the existence of bornite. As highlighted by the Bristow Report, we are starting with a solid base that we will continue to add to with exploration." All information of a scientific or technical nature contained in this document, including sampling, analytical and test data has been reviewed and approved by Kevin Wells, P. Geo., a consulting Geologist to Nicola Mining. Wells is a Qualified Person as defined by National Instrument 43-101 — Standards of Disclosure for Mineral Projects. Nicola Mining applies a thorough quality assurance/quality control program at the New Craigmont Project compliant with industry best practices. A qualified geoscientist has logged and sampled all core and samples have been delimited according to lithologic, alteration and mineralization characteristics. This includes systematic insertion of blank, duplicate and certified reference materials into the sample batches by Nicola's geological staff. Core is then halved, where the sample is placed in a labelled sample bag with sample tag and the other half of the core is retained on site as a physical record. Samples are placed in sealed bags and transported to Actlabs (ISO 17025 Certified) in Kamloops, British Columbia for analysis, following a Chain of Custody. Samples are crushed up to 80% passing 2mm, rifle split (250 g) and pulverized to 95% passing 105 µm. Samples are analyzed using Aqua Regia-ICP-OES 38-element (1E3) packages. All samples greater than 10,000 ppm Copper are tested using over-limit mass spectrometry methods (8-AR). All results included in this release have passed the QA/QC procedures as described above and have been reviewed by Kevin Wells, P.Geo. There are no known factors that could materially affect the reliability of data collected and verified. No quality assurance/quality control issues have been identified to date. There are currently no mineral resource estimates on the Property. Historical "non-NI 43-101" resource calculations are recorded in internal memos and geological reports for Placer Development. An internal memo written by J.F. Bristow on October 30, 1985 to Craigmont Mines Ltd. reported a zone known as Body No. 3 containing a historic estimate of 1,290,000 tons (1,170,268 metric tonnes) of copper grading1.53% copper. This estimate assumes a 0.7% copper cut-off and a 20-foot mining width between drill sections 6565E and 8015E. The material in Body No. 3 contains mineralization primarily in silicate-rich rocks. It should be noted that these historical estimates do not meet the requirements needed to conform to National Instrument 43-101 standards. The Company notes that an independent Qualified Person has not done sufficient work to verify and classify the historical estimates as current mineral resources and is therefore not treating the historical estimates as current mineral resources or mineral reserves. For further details on the Property, see the technical report entitled "TECHNICAL REPORT on the THULE COPPER — IRONPROPERTY, Southern British Columbia, Canada", filed on May 8, 2013 on Sedar at www.sedar.com. All statements in this release, other than statements of historical fact, are "forward-looking information" within the meaning of applicable Canadian securities laws, including statements that address future exploration and drilling plans, including with respect to the 2018 DD Program; the expected information to be derived therefrom; and potential mineralization. Forward-looking information is often, but not always, identified by the use of words such as "seek", "anticipate", "plan", "continue", "estimate", "expect", "project", "predict", "potential", "targeting", "intends", "believe", "potential", and similar expressions, or state that certain actions, events or results "may", "should", "could", "would", "might" or "will" be taken, occur or be achieved. These statements involve known and unknown risks, uncertainties and other factors which may cause the actual results, performance or achievement of the Company to differ materially from those anticipated in such forward-looking information. Such factors include, among others: changes in 2018 DD Program parameters as plans continue to be refined; risks related to the interpretation and actual results of historical exploration at the Property; reliance on technical information provided by third parties, including access to historical information on the Property; current exploration and development activities; current economic conditions; future prices of commodities; possible variations in grade or recovery rates; failure of equipment or processes to operate as anticipated; the failure of contracted parties to perform; labor disputes and other risks of the mining industry; and delays in obtaining governmental approvals, financing or in the completion of exploration. Although the Company has attempted to identify important factors that could cause actual actions, events or results to differ materially from those described in forward-looking information, there may be other factors that cause actions, events or results not to be as anticipated, estimated or intended. There can be no assurance that such information will prove to be accurate as actual results and future events could differ materially from those anticipated in such statements. Forward-looking information is provided as of the date hereof and accordingly is subject to change after such date. The Company does not undertake to update any forward-looking information included in this news release, except as required by applicable securities laws.